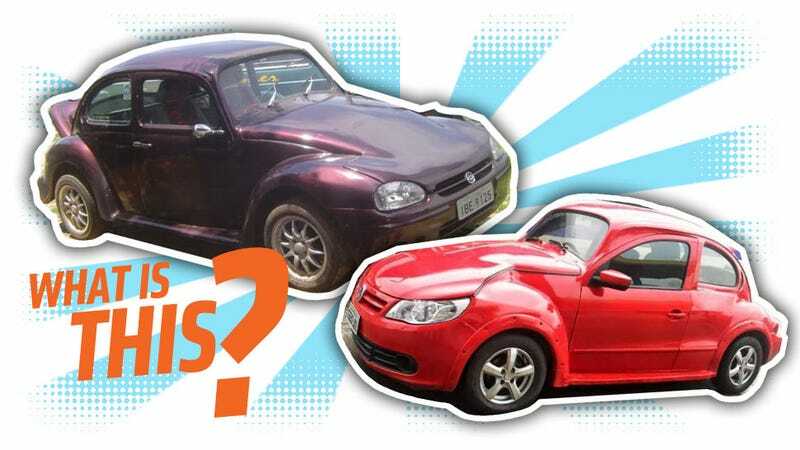 What Is This Bonkers Brazilian Beetle Customizing Trend Called? I know a big part of my job involves finding interesting things to talk to you about, but this time I’m going to have to do things a little backwards. I’ve found something strange and fascinating, but I need some help to research it further. All I really know is that it’s Brazilian, involves classic Beetles, and is absolutely bonkers. The pictures should probably give you a pretty idea of what’s going on: old Brazilian Type I Volkswagen Beetles, known there as Fuscas, are being modified in all manner of unholy ways to include entire front and rear ends from much more modern cars, including modern water-cooled Volkswagens like Golfs and Polos. I’ve seen these around in pictures for a while now, and I’ve seen enough cars to realize that this is not just some one-off Frankenstein experiment from a talented yet deranged tinkerer, but is rather an actual movement, a strange, fringe subculture in the classic Volkswagen community. The common threads between the cars seem to be that as much of the front end as possible needs to be from a modern-ish car with a full-width body, large, modern light units, a grille, and modern plastic bumpers. Mating this sort of front end to a 1930s-design-era Beetle is no simple task, and you see a variety of interesting solutions to meld the full-width modern front clip to the Beetle’s separate fenders/narrow main body look, with varying degrees of success. Usually, these cars also have taillights from modern cars grafted into the Beetle, and sometimes the entire rear clip as well. Mechanically, most seem to retain the stock air-cooled/rear engine Type I platform, but I have seen one or two with water-cooled front engine setups as well. The one thing these all seem to have in common is that the roof and center body section retains the traditional Beetle/Fusca look, to remind all lookers what this strange beast started life as. I find these cars amazing not because they’re aesthetically pleasing – they’re generally not, if we’re honest, and almost all references to them online that I find convey a similar reaction of horror and disgust. And that’s what I think I love about them. These Frankenfuscas are a defiant slap in the face of conventional taste, and I think their builders have to be aware of this. The quality of the work on many of these is extremely high, and these conversions could not have been easy at all. I think these cars are deliberately provocative and insane, a sort of joke taken to its limit. The best luck I’ve had finding these has been to Google portmanteau names like “Fuscagolf” and “Fuscagol,” which gives the best results. Maybe the movement is called something like that? Does it even have a name? If not, I think we could call it the Fuscenstein Look, after the Frankenstinean nature of it all. In that sense, they’re sort of like Donk culture, which is self-aware enough to know that most people are baffled by what they do, and they delight in that. So, if any of our readers can help direct me to where I can learn more about these cars, and maybe get a sense of their context or who builds and drives these things, I’d really appreciate it. I’m looking to celebrate this insanity, not ridicule it, so whoever you are and whatever you call yourselves, please let me know!